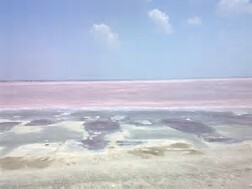 The Sambhar Salt Lake, India's largest inland salt lake, a bowl shape lake encircles historical Sambhar Lake Town located 96 km south west of the city of Jaipur The lake receives water from an endothecia basin with 5700 square km catchment area. It is not part of the Ganga river basin area and is geographically a separate land locked river basin. The lake is actually an extensive saline wetland, with water depths fluctuating from as few as 60 centimeters (24 in) during the dry season to about 3 meters (10 ft) after the monsoon season. It occupies an area of 190 to 230 square km, based on the season. It is an elliptically shaped lake 35.5 km long with a breadth varying between 3 km and 11 km. It is located in Nagaur and Jaipur districts and it also borders the Ajmer district. The circumference of the lake is 96 km, surrounded on all sides by the Aravali hills. The Sambhar lake basin is divided by a 5.1 km long dam made of sandstone. After salt water reaches a certain concentration, it will be released from the west side to the eastern side by lifting dam gates. To the east of the dam are salt evaporation ponds where salt has been farmed for a thousand years. This eastern area is 80 km². and comprises salt reservoirs, canals and salt pans separated by narrow ridges. To the east of the dam is a railroad, built by the British to provide access from Sambhar Lake City to the salt works The water is fed to the lake from streams from the rivers Mendha, Runpangarh, Khandel and Karian. The Mendha and Rupangarh are main streams. The Mendha flows from south to north and the Rupangarh flows from north to south. It is India's largest saline lake and is the source of most of Rajasthan's salt production. 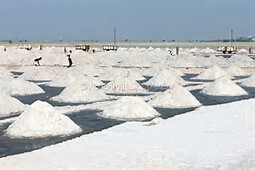 It produces 196,000 tonnes of clean salt every year, which equates to around 9% of India's salt production. Sambhar has been designated as a Ramsar site (recognized wetland of international importance) because the wetland is a key wintering area for tens of thousands of flamingos and other birds that migrate from northern Asia. The specialized algae and bacteria growing in the lake provide striking water colours and support the lake ecology that, in turn, sustains the migrating waterfowl. There is other wildlife in the nearby forests, where Nilgai move freely along with deer and foxes. 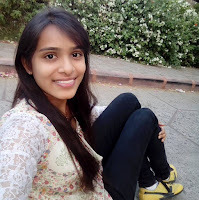 I am Disha Mehta. I am really glad to tell that I am one of those rare students who started and completed their studies from The Fabindia School. I have pursued my CS Executive and M Com. from JNVU. I am designated as relationship officer in Indusind Bank, Falna. I am from batch 2009-10. I remember my classmates Darshan, Ajaydeep, Yaghyapal, Parikshit and others. I thank God for giving me teachers like Parineeta Ma'am, Sukanya Ma'am, Rahul Sir and Bharti Ma'am moulded me to reach such a level of life and success. I can't forget those golden moments of my life when I was awarded for my Academic Performance by the Collector and received medals from Gold Medalist Bhagwan Pehlwan.Fabindia was not less than a family for all of us. With academic efforts it has also groomed us in several others ECS. Interview: ED: Editor, TMA: Tarun Mishra. TMA: I had join the school on 20th March 2015. TMA: Mrs Deepika Tandon was the Principal at that time. 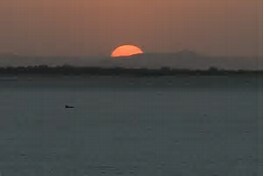 TMA: The environment was very beautiful and according to my knowledge or experience it is a good place for studying. TMA: I taught Class Eleven at first. TMA: Yes there are some students that are still in contact with me. TMA: I have completed my PG from D.A.V.V. University Indore (M.P.). I have done 6 months Yoga Certificate Course from D.A.V.V. University Indore(M.P.). I have done diploma Advanced Computer Certificate Course(ADCA). I am Pursuing P.H.D. ED: Which schools have you taught before Fabindia? TMA: I taught DPS and PIS before Fabindia. TMA: I want my children to fulfill their physical efficiency and I am trying to suggest the children about physical education with only one motto: Attain, maintain and promote good health. ED: What message would you like to give to your students? TMA: Through this field I expect from my students to develop their all three dimensions physically mentally and socially well-being. We the staff of The Fabindia School deeply condole the untimely and sad demise of the mother of Mr. Krishan Gopal who left for heavenly abode on 28th April’17. We pray Almighty to grant peace to the departed soul; May God bestow strength to the bereaved family to bear this irreparable loss. Weather in Bali is becoming increasingly hot. The sun is shining bright all throughout the daytime. It has become difficult to go out during the afternoons. Students prefer to play indoor games due to the hot weather. Highest was recorded at 41°C and lowest at 24°C. Humidity dropped down to 9% and the wind blew at 10km/hr. According to my opinion Morning Assembly is important because Morning Assembly keeps us fresh whole day as we can easily concentrate on our studies. I think that Morning Assembly is necessary for all the students because in this way they can worship God and thank God for whatever God has given to them. We can also learn prayers that we say every day. If there is no Morning Assembly we won't understand the importance of God. Due to Morning Assembly we are aware of the events that are going to be organized or that have taken place in our school. In this way the announcements can be heard by all the students at the same time. Teachers don't have to repeat the announcement in the classes again. Morning Assembly is also very helpful for them also. From my point of view each and every school should have Morning Assembly -Kreena Rao/ IX/ DH. Because it gives light and shine. Which gives you beautiful scenery. That we take care of them. Plants play a important role in our life. 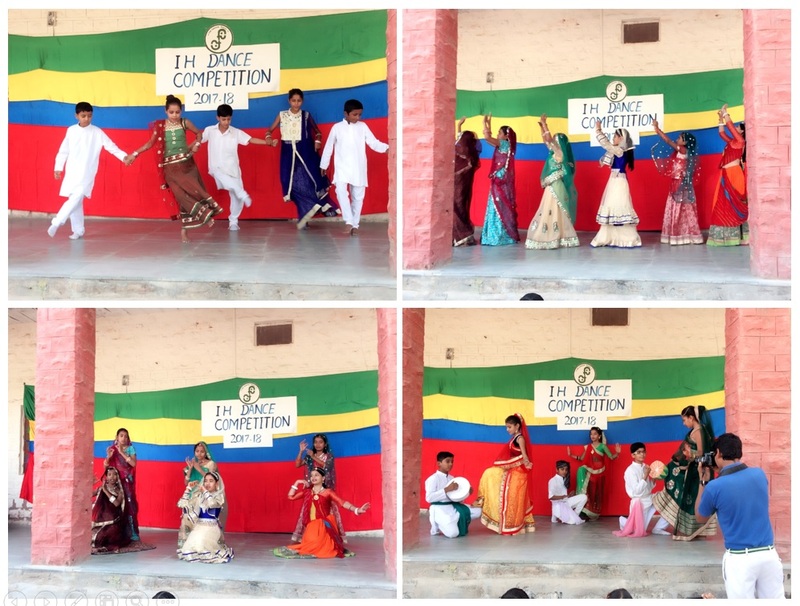 Saturday, 29th April: IH Dance Competition for Class IV to VI was organized on the occasion of International Dance Day. There were four houses and they performed folk dance of the country. 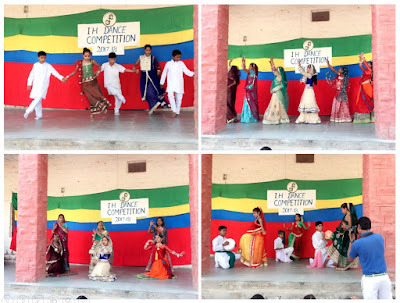 Dhyanchand House performed Kashmiri Folk Dance, Gandhi and Raman House performed Rajasthani Folk Dance and Teresa House performed Gujarati Folk Dance. They gave a beautiful performance. Judges of the competition were Mr Tarun Mishra and Ms Swati Sood.